Sen. Daniel Biss (D-Evanston) and Rep. Robyn Gabel (D-Evanston) talk to residents about legislative issues in a town hall meeting before the state general assembly convenes. 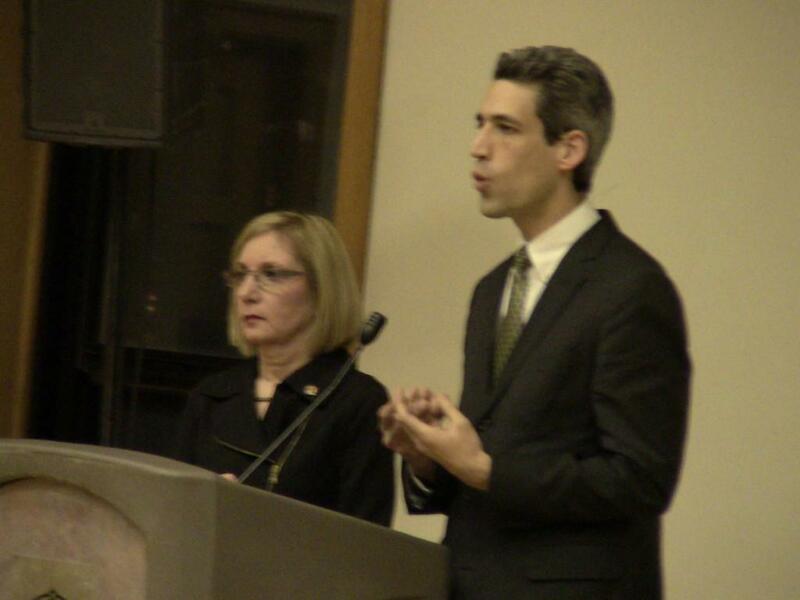 Evanston residents voiced their concerns Thursday on Illinois’ fiscal issues before state Sen. Daniel Biss (D-Evanston) and state Rep. Robyn Gabel (D-Evanston) at a packed town hall meeting. At the Lorraine H. Morton Civic Center, public employees voiced their distrust in their relationship with lawmakers in light of the pension reform bills progressing through the Illinois General Assembly and their potential threats to retirement benefits. “Everybody says we’re blessed to have jobs … I say I’m blessed but it’s hard to trust when you get stabbed in the back constantly,” said Michael Wonderlich, a public employee of 18 years. Biss’s own proposed solution to the pension crisis failed last month, when his comprehensive pension reform bill fell short by seven votes before the Illinois Senate. City employees also brought up concerns about whether the pension crisis stemmed from a revenue problem. Gabel noted that Illinois has stretched itself thin looking for additional income through means such as a personal income tax hike. Gabel also outlined the $35 billion state budget proposed by lawmakers which she said had discrepancies with the governor’s proposed $35.7 billion budget. The budget devotes 39 percent of the budget for K-12 grade education, 31 percent to human services and 12 percent to higher education. Biss said the state needs to reform its tax codes and programs to get back on track fiscally. “I think we want the conversation to include very, very, very honest and different looks at all of the pieces of the budget,” Biss said.